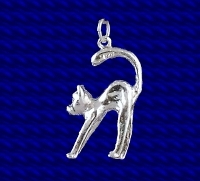 Sterling silver Chimney sweep charm. In the U.K. chimney sweeps are considered lucky and as such the silver chimney sweep charm is a popular wedding charm. Craftsman made Sterling silver Chimney Sweep charm. Approx. size 14mm x 23mm.